These photographs provide a glimpse into life in Imperial Japan — a tour through the lives of the country's poorest and most glamorous. A torii gate stands over the streets of Yenoshima. A thick bamboo grove towers above the heads of a band of travelers. A Buddhist warrior monk, wearing his clerical robes over his armor. 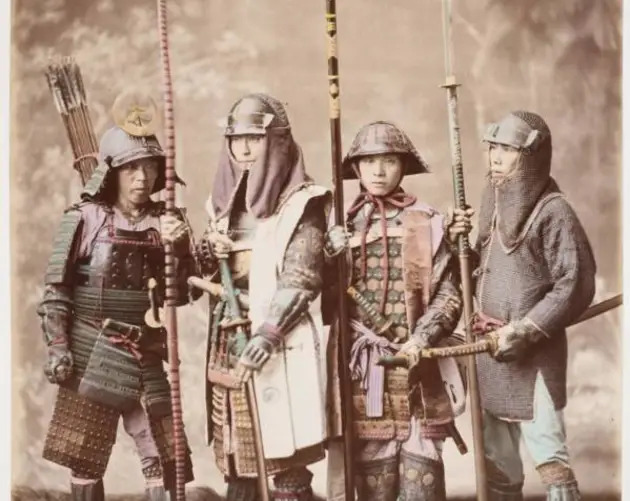 Four samurai warriors, showing off the diversity of weapons they used. 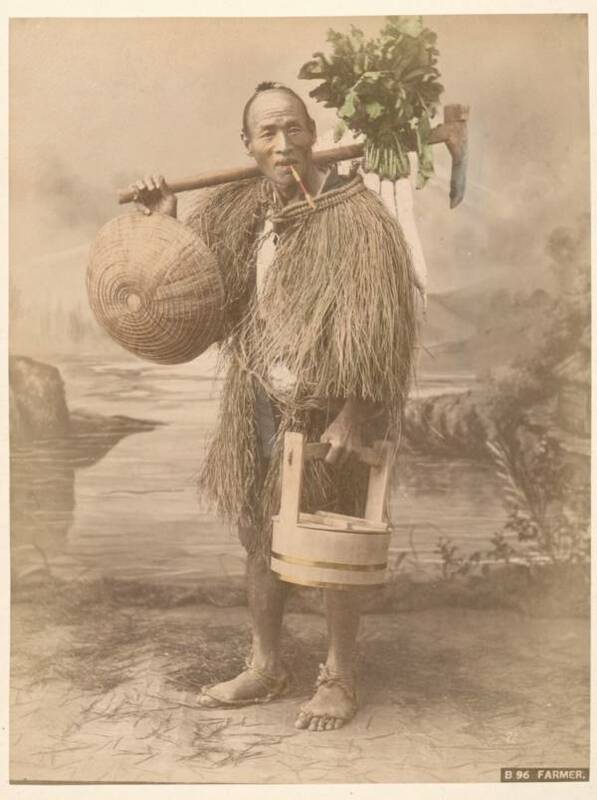 A farmer in a mino, a straw cape meant to protect him from the rain. Peasants work picking tea, while a temple looms behind them. A Japanese man shows off the tattoos that cover his body. An old Japanese village, photographed from above. 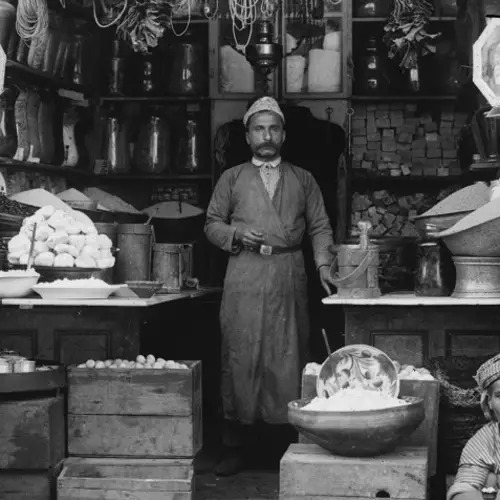 A vendor sells his goods on the street. A man watches the sea from inside a rock formation. A child stands in a clothing shop. Men at work making a tub. An old vegetable peddler shows off his selection to a customer. A tea house in Nakasendo. Four peasants carry a wealthy woman in a traveling chair, called a kago. A tea house sits near a canal. Two monks stand before a Buddhist statue. 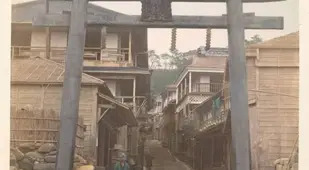 An empty street in an old Japanese town. A woman puts on makeup and gets ready for her day. One woman helps another braid her hair. Two upper-class women bend down to feed some chickens. The workers in a kitchen prepare dinner. Porters carry a woman in a kago. Several people prepare to set sail. A boat full of people travels down the Sumida River. Workers draw water from a well. An elderly couple seated before a painted background, acting out a scene of sitting by the roadside to rest. Peasants at work threshing rice. 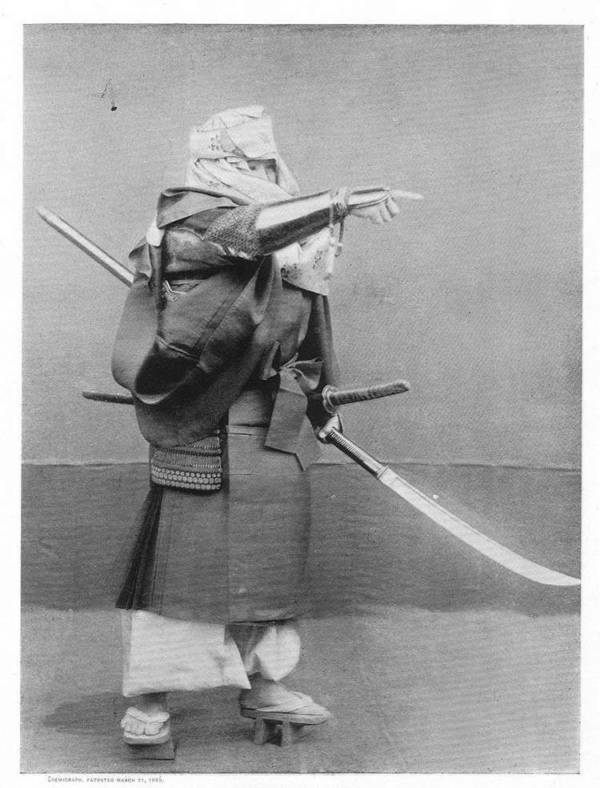 A samurai warrior with his hair in a "chonmage" topknot. A bridge sits over a calm river. A fireman sets up a letter by a tea house as part of a drill. Members of the fire brigade compete, performing stunts on ladders extended to the sky. A craftsman builds samisens, a traditional Japanese lute. Young boys play a game in the courtyard. A street full of theaters, filled with banners advertising the shows inside. A crowd lines up outside a theater, eager to see the performance within. 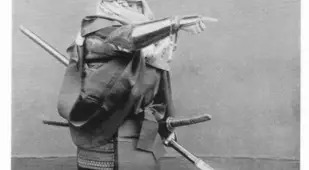 Four kabuki actors dressed as samurai. Some incredibly flexible boys perform a rope dance. 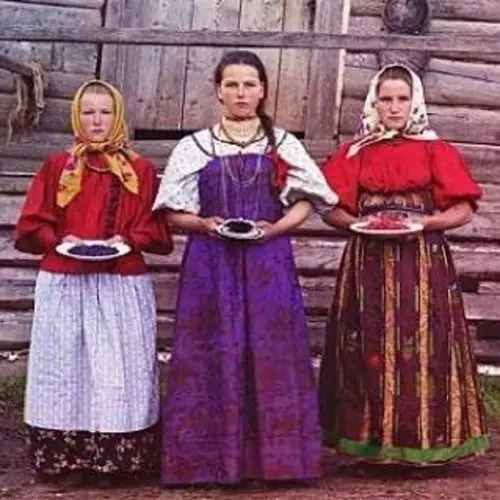 Three dancers pose for the camera. A man gets down on his knees in prayer at the steps of a temple. Four young pilgrims stand before a shrine. A lone man sits on a rock, overlooking the running water. Women enjoy the flowers in a peony garden. Two kago bearers carry a wealthy woman around. A man walks along the Kisogawa River. A man walks along a road that winds up a mountainside. Imperial Japan looked unlike any place in the world today — certainly the country that now stands on the same ground. It is a place that lives on only in stories and photographs. 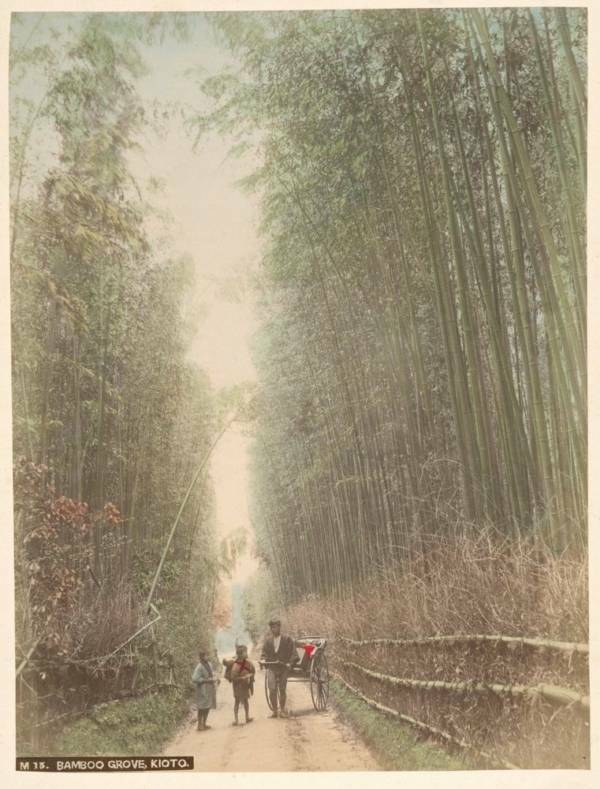 These photographs are the best glimpses we have of what life was like in Imperial Japan – photographs from the late 19th century, taken during the Meiji Restoration Era. By then, the early cracks in the old Japan were already starting to form, and Western thought was seeping in. The Empire was being reshaped in the image of Western nations. A constitutional monarchy was formed, the samurai were abolished, and the royal court started to dress in Western clothes. Yet despite it all, little pieces of Japan’s distinct culture still lingered on. 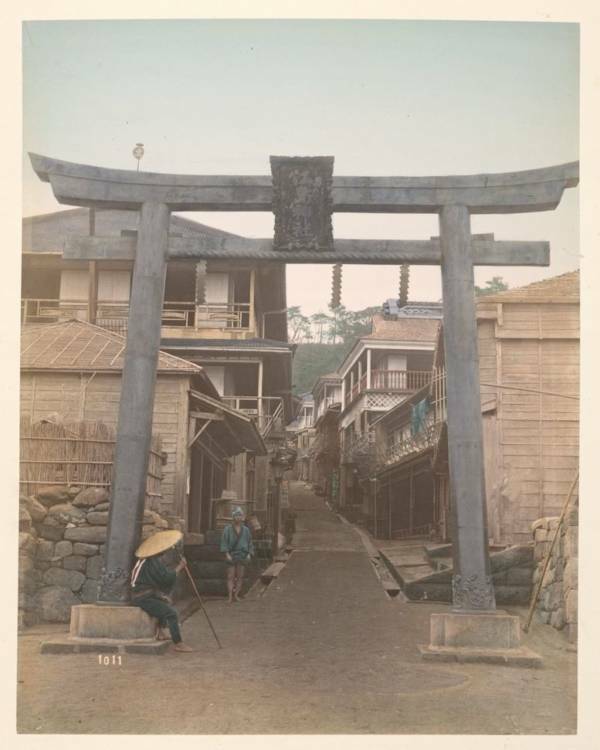 The photographs from this era provide a look at the world that is now a memory, a look into the streets of Imperial Japan, where one-story homes with thatched roofs flanked streets filled with vendors who carried their goods on their backs. 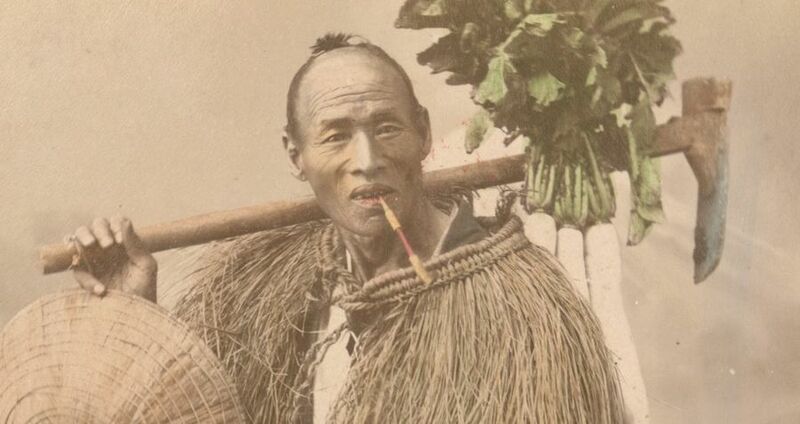 Late 19th-century photographs allow us to tour the old Japan, from the poorest and meanest forms of life to the most glamorous. 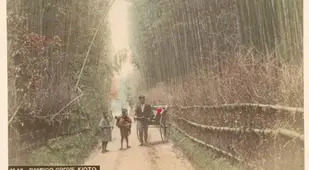 We can see the lives of the Japanese peasants who covered themselves with straw for protection from the rain while they got down on their hands and their knees to harvest rice and tea leaves. 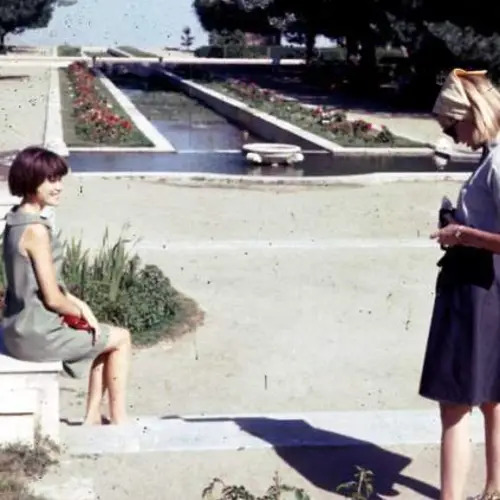 Yet we can also see the lives of the wealthy elite, living in the massive stone palaces that towered over the country, where women dressed in kimonos and painted their faces white before being carried about in baskets held up by peasant workers. These photographs are our window into Imperial Japan: a world that once was, but will never be again. Next, check out this glimpse of life in Qing dynasty China, before the country's communist transformation. 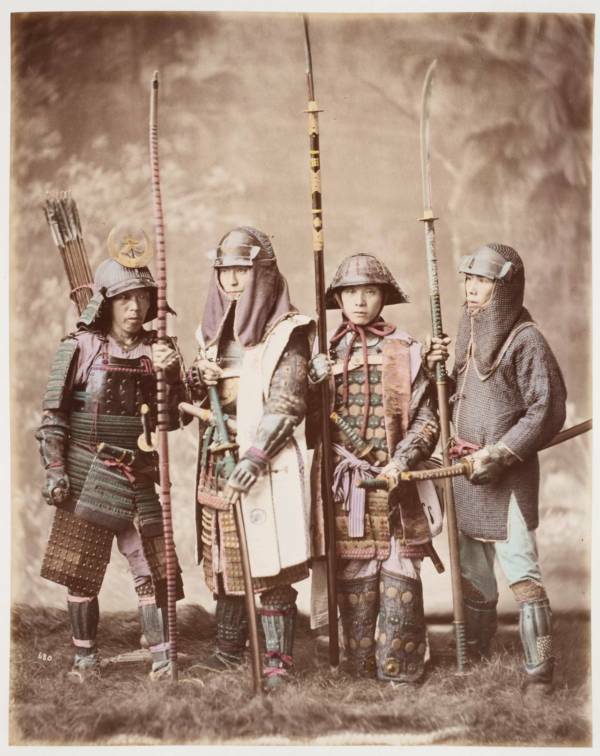 Then, see these gorgeous vintage photos of the last samurai.